Microsoft like being pushed, it seems. No other explanation of how well it did with the Surface considering the pressure pot of high stakes and overwhelming expectations. It didn't take its eyes off the target either, knowing (though hardly enjoying the fact) that the iPad is the tablet to beat. Yet, despite generations of hardware and software advancements, iOS hasn't become the hallmark of handheld productivity, and thus give PCs a real challenge. It's a multimedia consumption device and that's what gives the Surface a chance to get a slight edge. Microsoft offers plenty of content under the Xbox umbrella, ranging from music to movies and TV shows, from handheld to full-blown console-quality games. But the numbers behind the iPad can't be matched, not yet anyway. Windows RT has a long way to go - the app count is still low and the fact that you can't run legacy Windows software on RT doesn't sound particularly enticing. The Microsoft Surface RT is a bold statement nonetheless. It's got good enough internals into one of the hottest bodies in the business. The VaporMG casing feels cooler than anything we've held recently and the kickstand and magnetic detachable keyboards go a long way to make the Surface unique and desirable. And once you get past the probability of confusion of using Windows on a tablet and discover all the gestures you can dig a little deeper into the OS you realize Microsoft invested quite a lot of time and effort. The learning curve might be a bit steeper than you are used to, but the reward is worth it. The Surface RT starts at $499 for a 32 gig model and you could get the keyboard option for another $120 bucks, which propels Redmond's tablet right into iPad territory. The iPad 4 offers 16 GB of storage for the same $499, which isn't all that different given that the Windows RT takes up between 6 GB and 8 GB to boot. The iPad has the superior A6X chipset with an impressively potent graphics chip. It also has the upper hand in screen resolution and quality - and then goes on to humiliate all likely competition in terms of apps and quality content. Not that it's make or break, but the iPad 4 also boasts a better camera. The Surface RT, however, responds with expandable storage, a standard USB port with host support, and proper file management. Heck, you could even hook up an iPad and get access to at least the photos on it. Full-fledged Office support on the Surface, right out of the box, is also a value-adding feature. iGadgets are not the only ones the Surface needs to keep an eye though. There're Google tablets and even Microsoft-powered slates by makers that are partnering with Redmond. The Nexus 10 is an option you just can't ignore. The Google tablet runs Android 4.2 Jelly Bean, has the best screen specs around and all that costs $400, which is a bargain. Asus will want to have a say too when it comes to tablets with a keyboard option. The Android-powered Transformer Pad Infinity TF700T and Transformer Pad TF300 run on Tegra 3, have better cameras than the Surface and offer Android Jelly Bean already. The Transformer Pad Infinity packs a 1080p display and costs slightly more than the Surface, while the TF300 matches the Surface RT's price. Then there're the likes of the Samsung Ativ tab and the Asus VivoTab. Both are running Windows RT, and the Asus tablet even comes in transformer flavor with a dedicated physical keyboard. After the price-cut, the VivoTab costs as much as the Surface and adds an extra battery thanks to its keyboard dock. The Surface RT sure has its hands full. But it's got some definite advantages compared to its otherwise more seasoned rivals. You won't find better multitasking on a tablet - in terms of app switching and available options. It also beats the iPad on UI gestures, an area where Android fails to bring anything relevant to the table. There isn't a tablet on the market that can match the office support on the Surface either. Microsoft has done a solid job with its first tablet in terms of build and having it properly powered. Windows RT is good-looking and full of potential, especially if it manages to get developers on board. That's the thing really - the Microsoft Surface RT is seriously lacking in terms of apps and content. In its favor, it's not as heavily regulated as the iPads in terms of what kind of content you can load and how. 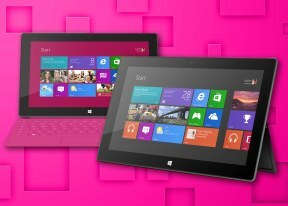 In short, we like the direction Microsoft is heading towards with the Surface and we wouldn't mind hitching a ride. Not at all actually, provided all due stops are made en route to pick up some essential companions. Dropbox and an FTP client would be a nice start.